Running the football is critical to the success of any NFL team. While the NFL has transformed into a pass-first league, history has shown that a productive rushing attack can help a team control any game. Establishing the run takes discipline. But first and foremost, you need to have the players who can make it all happen. Throughout history, we have seen many good running backs who have contributed to their teams’ success. 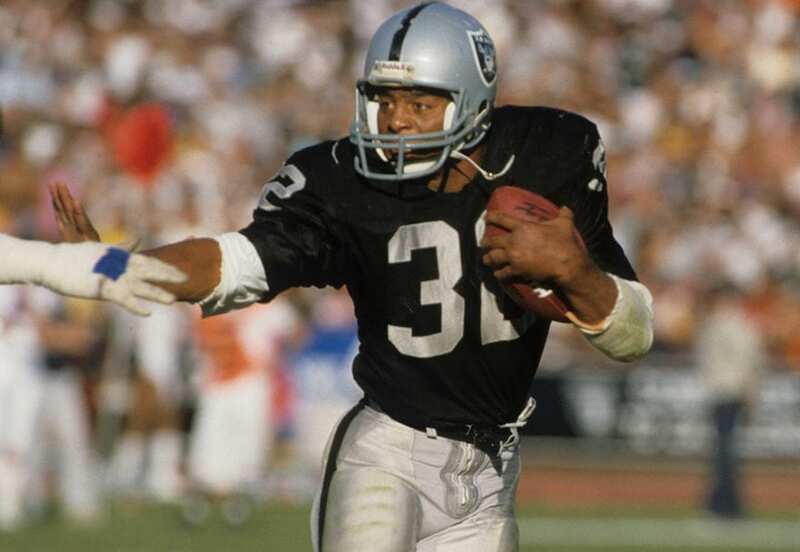 The following are the greatest running backs in NFL history. Each and every one of them has played above the norm at the position, and in the process has been able to achieve outstanding results. Whether on an individual level, or by carrying their respective teams to glory, these great players all have surpassed what we have been accustomed to seeing from a typical runner. 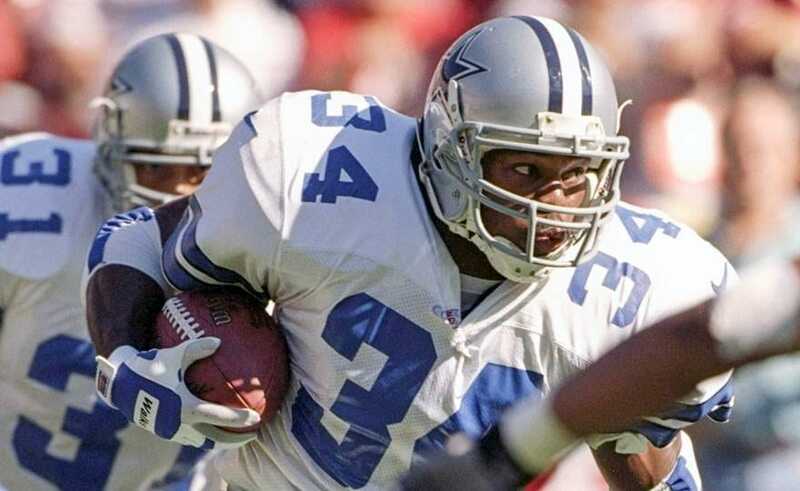 For these reasons, and much more, they have made the Sports Retriever list of the greatest running backs in NFL history. Jackson was a beast to bring down, but he unfortunately was unable to get the coveted Super Bowl ring he always wanted. 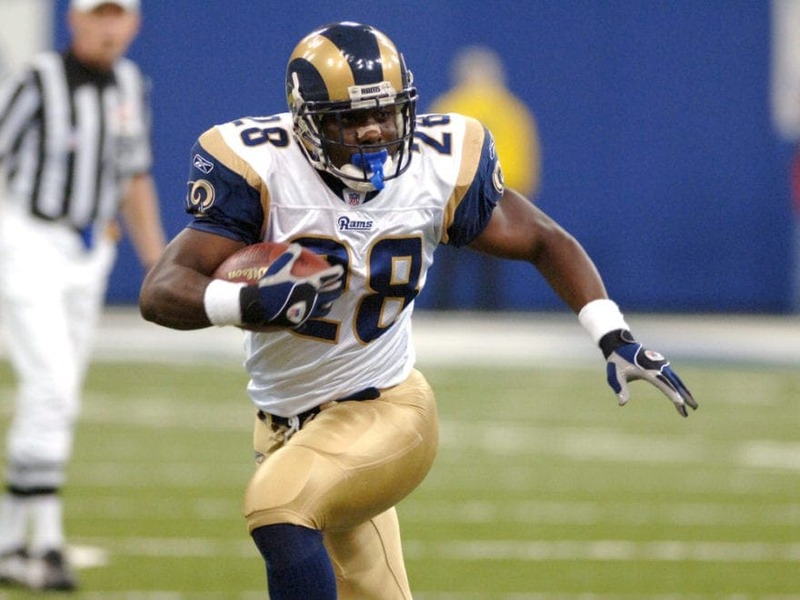 He was immediately thrust into a challenging situation, as he attempted to fill the shoes of the great Marshall Faulk, after the Rams drafted him in the 2004 NFL Draft. But he still made the most of his chances, rushing for 11,438 and 69 touchdowns during his career. He was a great checkdown option as well, recording 461 receptions for 3,683 yards and nine more touchdowns. 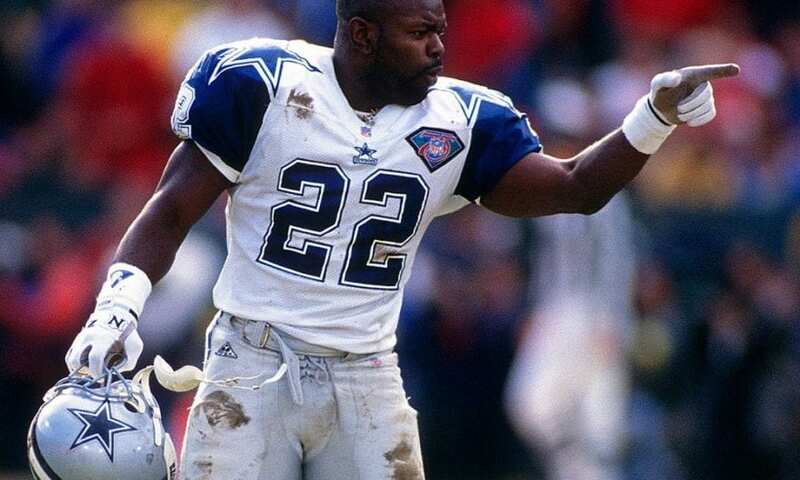 George came out strong at the outset of his career, winning NFL Rookie of the Year honors as he rushed for 1368 yards and eight touchdowns after being drafted in the first round in 1996. George was very consistent. In his first five years as a pro, he only had one season with less than 1,300 rushing yards (1,294 yards in 1998). George was a four-time Pro Bowl selection, who managed to tally 10,441 rushing yards and 78 total touchdowns (68 rushing, 10 receiving) during his career. You can sit back and watch a highlight reel of Walker in his prime, and you will be very impressed. Walker was a big play waiting to happen, and he was very explosive and dangerous in space. 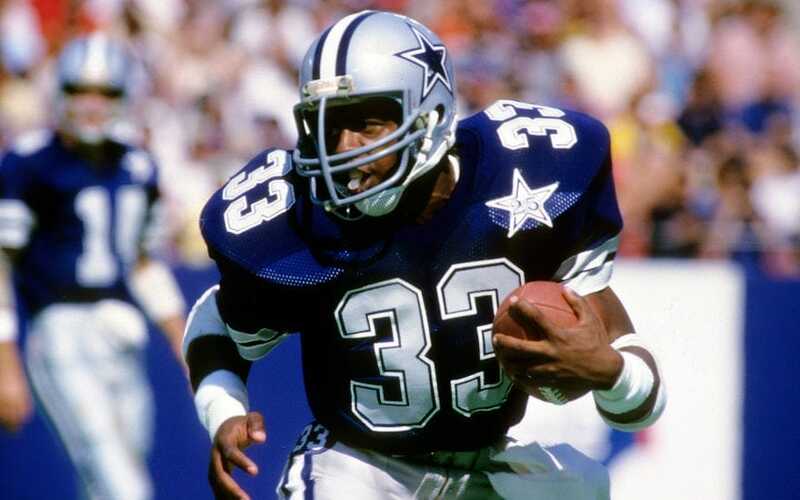 When he was drafted by the Cowboys, he joined a fellow Heisman Trophy winner in Tony Dorsett, and the two helped Dallas field arguably the best backfield in the league at the time. He set the tone in his rookie season, highlighted by a Week 15 game in which he recorded 292 total yards from scrimmage. He had two separate 84-yard touchdowns that day – one rushing and another receiving. Lynch is known for his quiet demeanor on the public stage. But there is nothing quiet about his game, or his punishing running style. 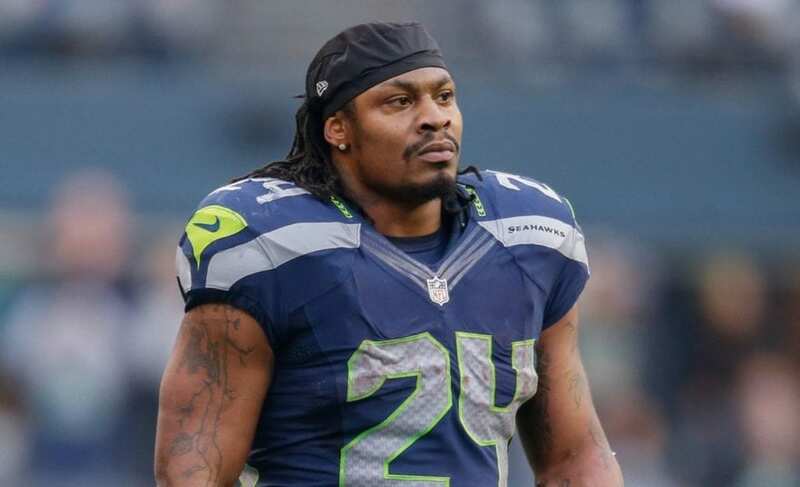 In fact, his “beast mode” runs tend to have a rumbling effect, due to his tendency of running over defenders. While he remains active for the 2019 season, he has already passed the 10,000 rushing yard mark and will look to add to his totals before he eventually retires. Lynch has led the entire NFL in rushing in back to back seasons (2013-2014). He was also a key factor in Seattle’s run toward a victory in Super Bowl XLVIII. Lewis was able to achieve the ultimate team accomplishment in his rookie year, when the Ravens won Super Bowl XXXV in 2000. He has a very strong rookie campaign, capped off by becoming just the second rookie to ever rush for 100 or more yards in a Super Bowl. But it wasn’t until the 2003 season when Lewis made a name for himself among the NFL’s elite. That year, he became a member of the ‘2,000 yard club,’ when he ran for 2,066 yards. It helped that he also set the single-game rushing record with 295 yards, earlier in the year. When you’re locked in to a head-to-head duel with Jim Brown and you come out on top, you have earned your spot on this list. That’s exactly what Taylor was able to do in 1962, when he edged Brown for the league rushing title. In the process, Taylor also received the NFL MVP Award that season. 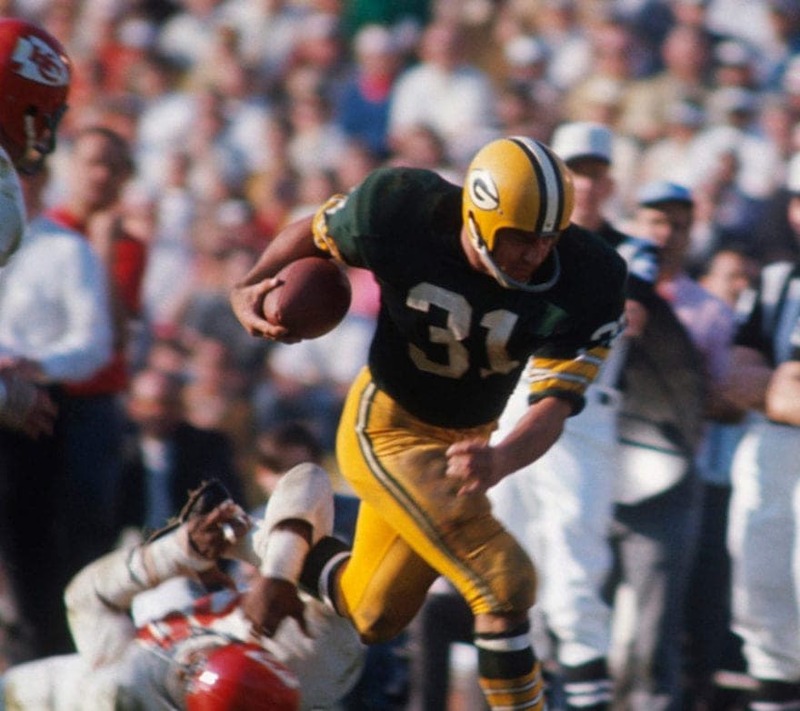 During his career with the Packers, he was able to win four NFL championships, including a victory in the first ever Super Bowl. Watters was one of the best running backs in his era. He quietly racked up a highly impressive overall career, due to his versatility out of the backfield. Not only is he a member of the 10,000 rushing yard club (10,643 to be exact), but he added another 4,248 yards through the air. In total, Watters accumulated 91 touchdowns as a pro. His most memorable performance was in Super Bowl XXIX as a member of the San Francisco 49ers. SF won the game, on the heels of three touchdowns from Waters, including a 51-yard touchdown reception in the first quarter. 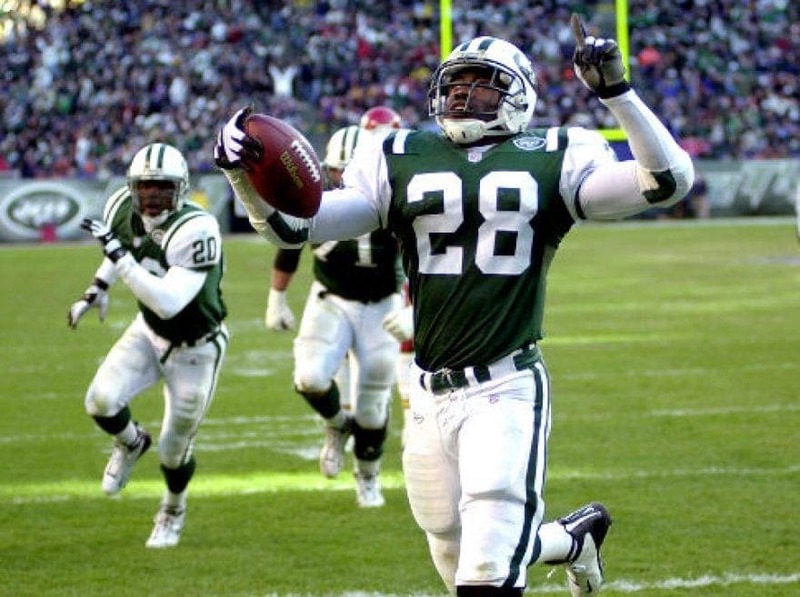 Drafted by the Indianapolis Colts with the fourth overall pick in the 1999 draft, James hit the ground running, winning Rookie of the Year honors for his strong performance. “Edge” would go on to have a very good career, setting franchise records for the Colts in rushing attempts, yards, and touchdowns. James finished his career with 12,246 rushing yards, which currently places him 13th on the all-time list. After the 2005 season, he went on to play for several years with the Arizona Cardinals before spending his final season (2009) as a member of the Seattle Seahawks. 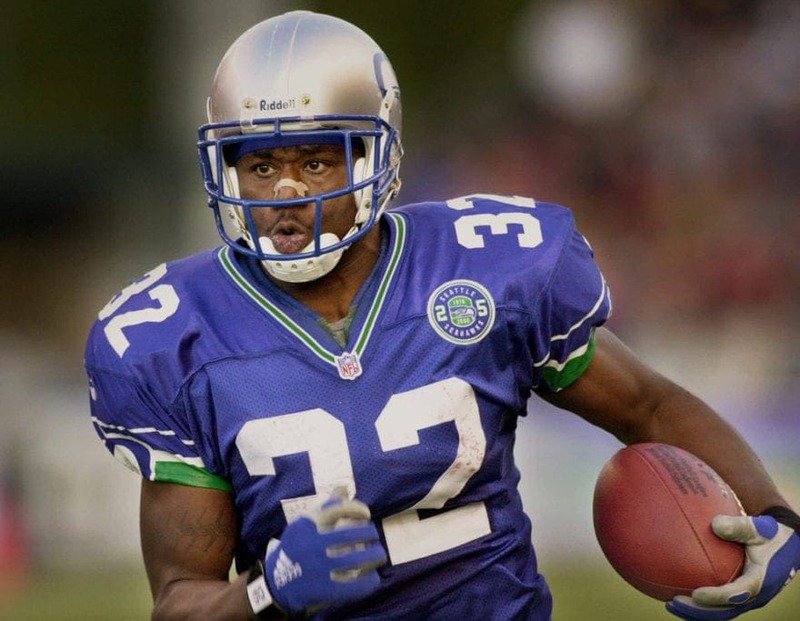 Drafted by the Seattle Seahawks in the first round of the 2000 draft, Alexander would go on to reach several impressive accolades during his career. His best season was in 2005, when he won the NFL MVP award. That season, he led the league in rushing with 1,880 yards. He also tied the NFL record that season with 27 rushing touchdowns. That was the second time he led the NFL in rushing touchdowns, with the first being in 2001 when he scored 14 times on the ground. Known as “The Jet” for his glazing speed from the fullback position, Perry would go on to have a great career at the pro level. From a historical standpoint, his most important accomplishment was becoming the first ever African American player to win the NFL’s MVP award in 1954. 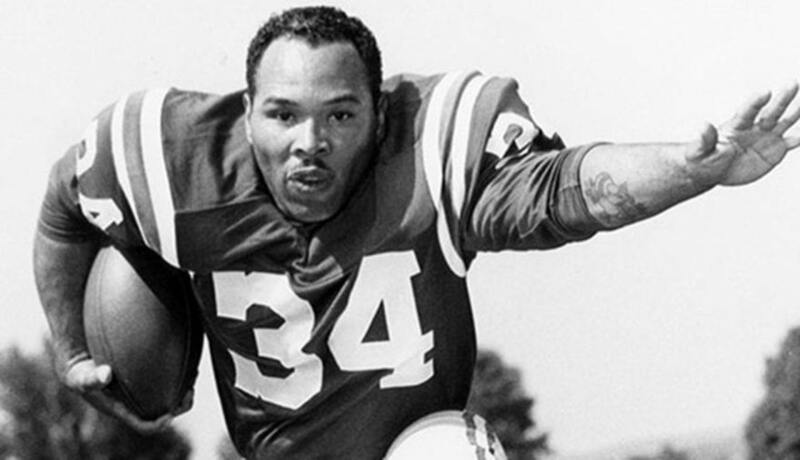 He was also the first player overall to ever rush for at least 1,000 yards in consecutive seasons (1953 and 1954). Perry was inducted into the Pro Football Hall of Fame in 1969. 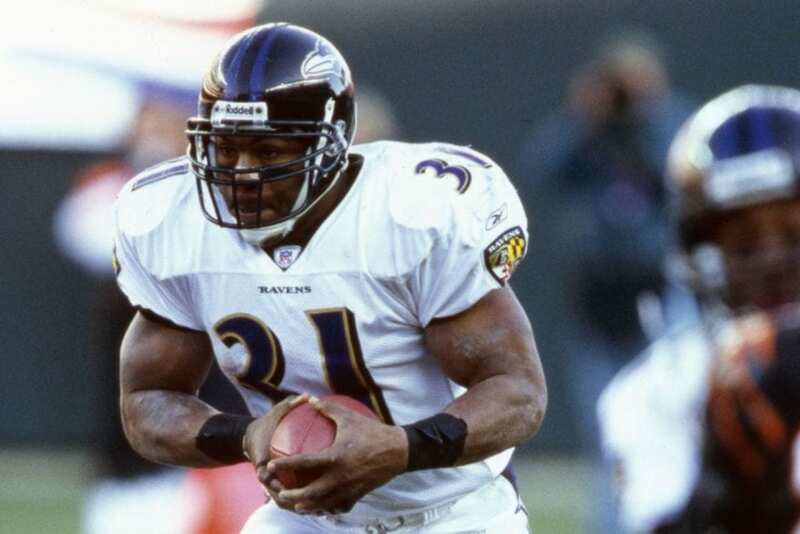 Holmes was an undrafted free agent and signed the Baltimore Ravens in 1997. He was able to contribute in a backup role during his four seasons with the team. When he received a real chance at a starting gig in Kansas City, his career really took off. 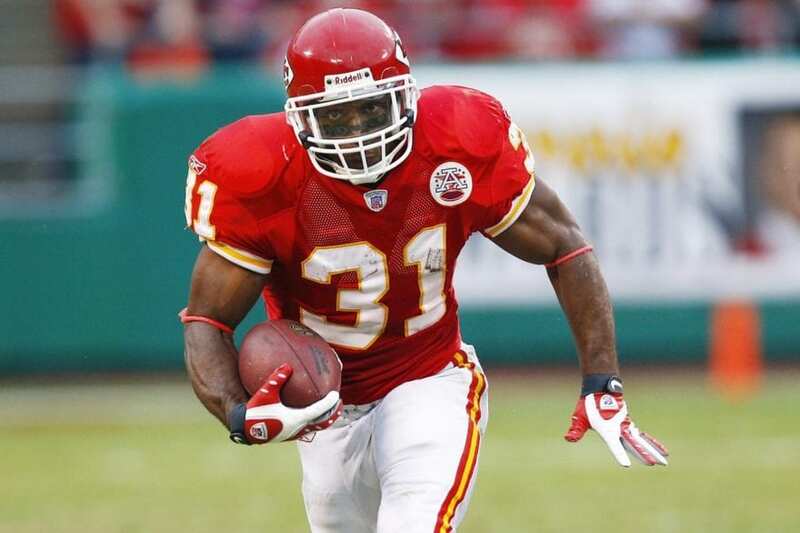 In his first season with the Chiefs, he took down the league rushing title with 1,555 yards. But he was just getting started, as he led the league in rushing touchdowns in each of the following two seasons. 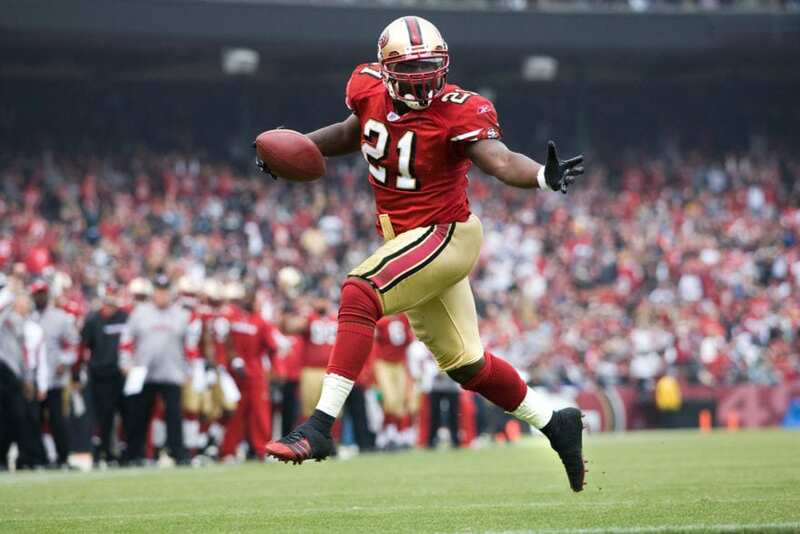 In 2002, he scored 21 rushing touchdowns as well as 1,615 rushing yards. 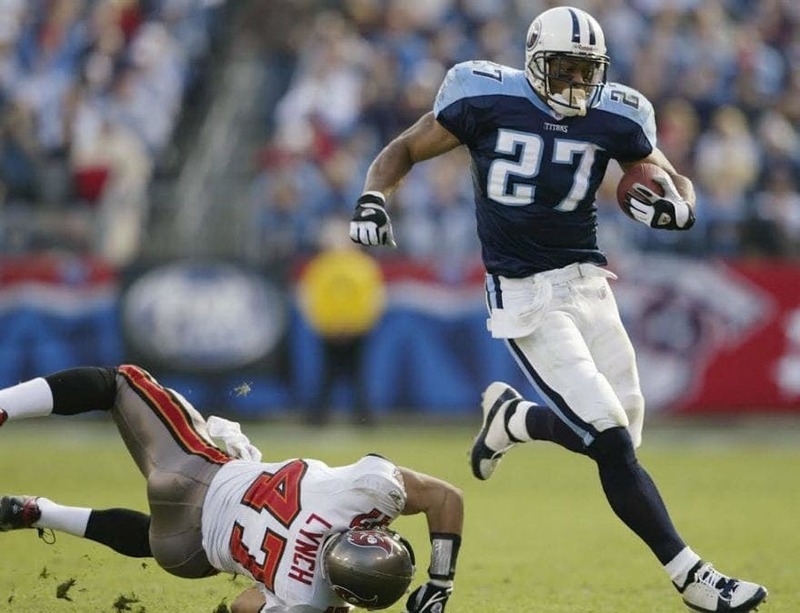 In 2003, he set a new NFL record with 27 rushing touchdowns, clearly becoming the top running back in the league during that three-year stretch. Jackson became notorious in the 1990s for his part in the “Bo Knows” Nike ad campaign. But his most impressive feat was the fact that he is the only person to ever receive All-Star recognition in both the NFL and MLB. Jackson was a “home run” hitter in football as well, as was evident during his short tenure in the league. Despite playing in just four seasons as a result of injury, Jackson was able to record a long run of at least 88 yards in three of those years. Jackson was initially drafted into the league by the Tampa Bay Buccaneers with the first overall pick in the 1986 draft. After he refused to sign with the team, he ended up being drafted the following year by the L.A. Raiders in the seventh round. 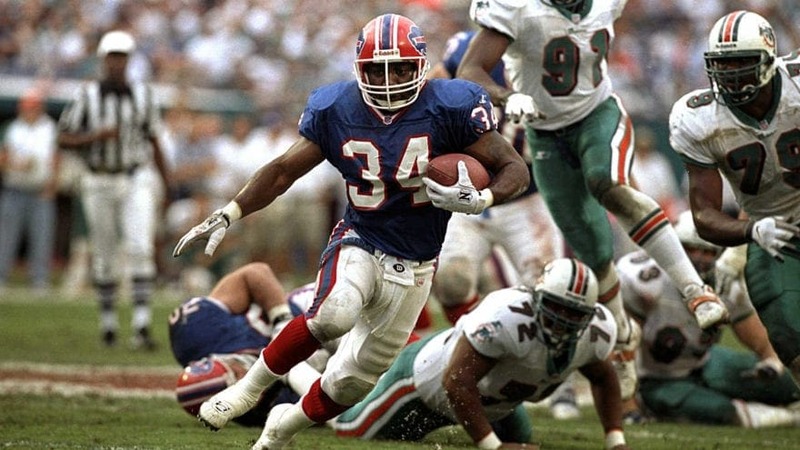 A key part of the 1990s Bills teams, which won four consecutive AFC Championship games, Thomas would end up recording a Hall of Fame career. His 12,074 rushing yards currently place him in 16th place on the all-time rushing list. Thomas was one of the most well known athletes in all of sports, as a star on the Bills’ no-huddle offense that made a run at four Super Bowl appearances in as many years. Franco Harris was a beast for the Pittsburgh Steelers in the 1970s. He was initially drafted by the team in the 1972 draft with the 13th overall pick, and he went on to have a Hall of Fame career (inducted in 1990). But Harris also solidified himself into football glory in historic fashion for his role in the “Immaculate Reception.” On that play in the final seconds of a 1972 divisional playoff game, quarterback Terry Bradshaw launched a desperation pass over the deep middle of the field. The pass deflected off a defender and was launched backwards into the hands of a surging Harris, who took it all the way to the house for the game-winning touchdown. Riggins is one of those guys who ages like a fine wine. 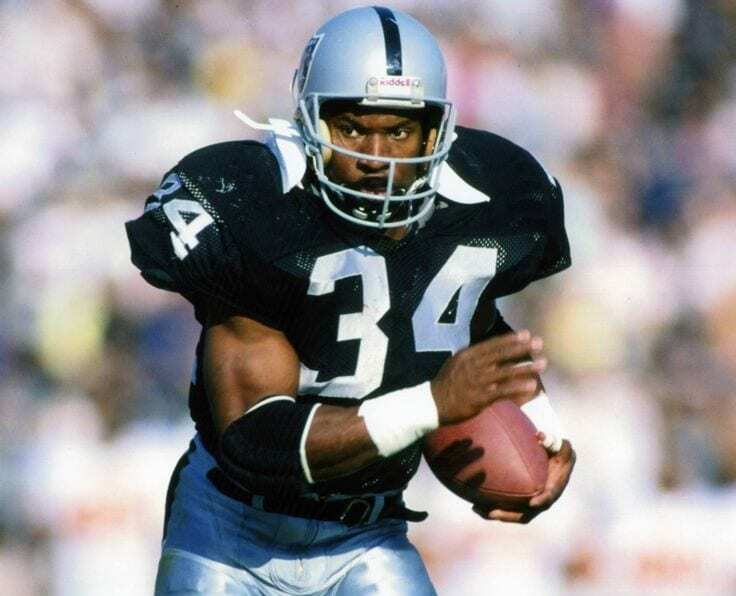 He had a record-setting 24 rushing touchdowns at the age of 34 during the 1983 season. Disproving any claims of a fluke season, Riggins put up another 14 touchdowns the following year, leading the league in that category again. 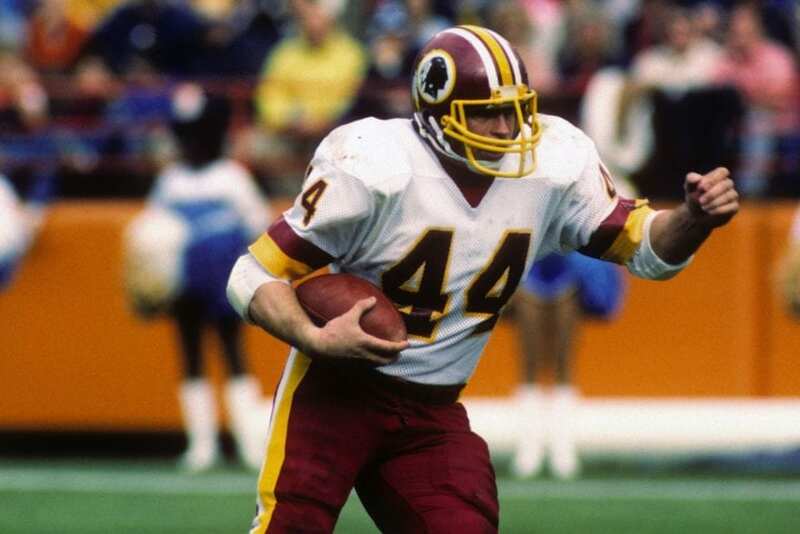 He also was a key member of the Redskins’ run at Super Bowl XVII. The team won the game, on the heels of a remarkable performance by Riggins. During the game, he had a whopping 38 rushing attempts for 166 yards and a touchdown, adding one reception for 15 yards. He was also named Super Bowl MVP for his tremendous effort in the game. Bettis earned the nickname “The Bus” for his rugged running style, running over opposing defenders. His punishing runs led defenders to be wary when trying to tackle him head on. After initially being selected by the Los Angeles Rams in 1993, he went on to rush for 1,429 yards and seven touchdowns on his way to Offensive Rookie of the Year honors. Bettis was a part of a trade during the 1996 draft, which sent him to Pittsburgh. In his first two seasons with the Steelers, Bettis rushed for 1,431 and 1,665, respectively. T.D. was widely overlooked, as his draft stock fell all the way to the sixth round in 1995, where he was selected by the Denver Broncos. His aforementioned nickname was justified, since he had a true nose for the end zone. Davis came on relatively strong in his rookie campaign, totaling 1,117 yards on the ground. But in the following three seasons, he really made a name for himself, putting together consecutive seasons with at least 1,500 rushing yards. T.D. 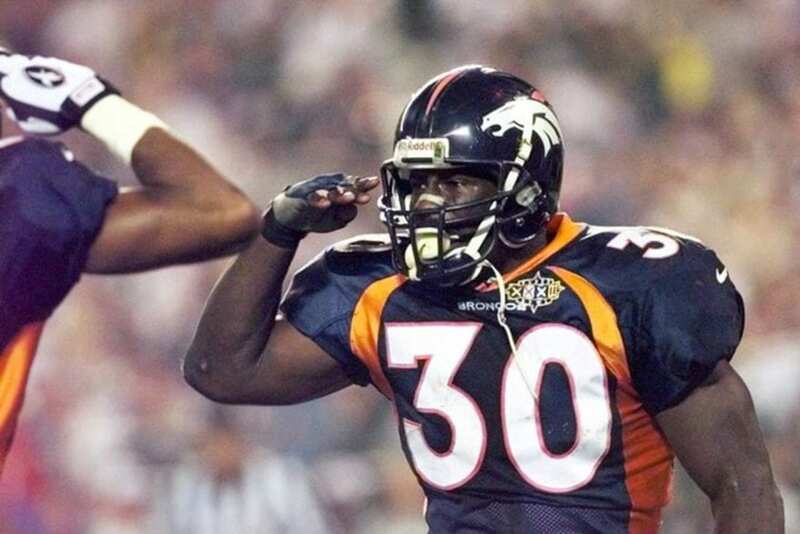 helped John Elway win his first Super Bowl in the 1997 season, also being named Super Bowl MVP in the process, for his incredible game of 157 rushing yards and three touchdowns. The following year, he ran for an astounding 2,008 yards and 23 total touchdowns, earning himself the league MVP award. 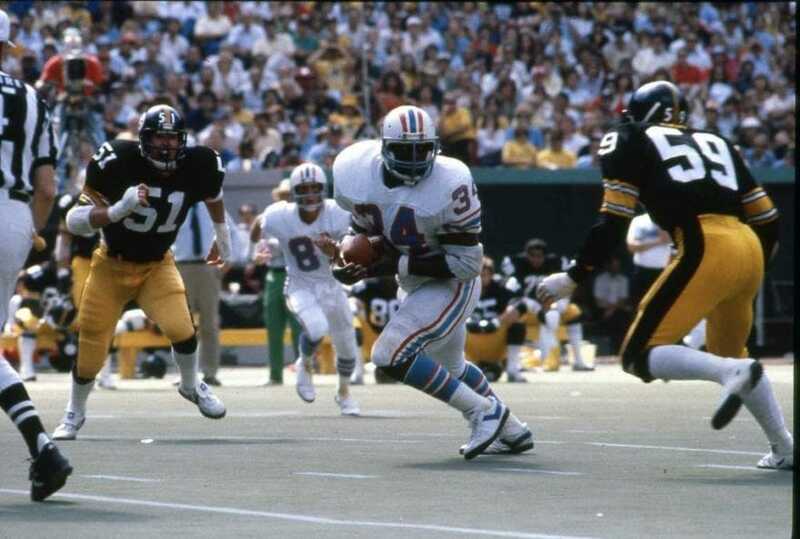 Back when running backs were much more revered assets, Campbell was selected with the number one overall pick in the 1978 NFL Draft by the Houston Oilers. He definitely rewarded them for taking him, as he was named Offensive Player of the year in each of his first three seasons in the league. In his second year, he ran for 1,697 yards and 19 touchdowns, earning himself the NFL’s MVP Award. He actually eclipsed his rushing total the following year, gaining 1,934 yards on the ground. Gore is still adding to his total career stats as we head into the 2018 season. One of the most underrated runners in the history of the league, Gore currently ranks fifth on the all-time rushing list with 14,026 yards. He needs just 76 more yards on the ground to move into sole possession of fourth place in NFL history. Moreover, he is in seventh place all-time with 17,698 total yards from scrimmage (not too far behind Barry Sanders). Gore is a model of consistency, as he has put up a highly impressive nine 1,000-yard rushing seasons over the course of his career. Martin is in fourth place on the all-time rushing list, with 14,101 yards. Drafted by the Patriots in the third round of the 1995 NFL Draft, Martin rushed for over 100 yards nine times in his rookie season. By the end of the year, he had accumulated 1,487 yards and 14 touchdowns. Before injuries caused him to retire, he was able to play 11 total seasons in his career. He rushed for over 1,000 yards in his first ten years as a pro. Martin was a first-ballot Hall of Famer in 2011. On the field, he was a great football player, who took the running back position to a truly amazing level. However, O.J.’s football accomplishments are overshadowed by his legal issues, particularly with regards to the alleged murder of his ex-wife Nicole Brown Simpson and her friend Ron Goldman. Nicknamed “The Juice,” for his running prowess, O.J. captivated NFL fans by being the first player in NFL history to ever surpass 2,000 yards rushing in a single season. Even more impressively, he achieved the feat in 1973, when the league was still playing a 14-game season. 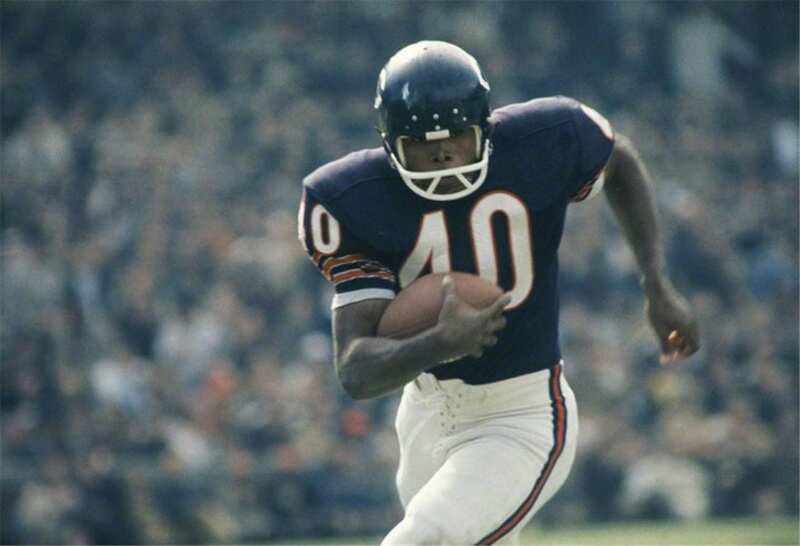 Also known as the “Kansas Comet,” Sayers was a highly elusive runner when he played for the Chicago Bears in the 1960’s. Another runner who took the league by storm from the start, Sayers had a ridiculous rookie season, in which he scored 22 rushing touchdowns. This number was aided by his record-setting six touchdown game against the San Francisco 49ers. While he accomplished this feat in his first year in the league, the single-game record still stands today. While knee injuries shortened his career, Sayers was still deserving of his 1977 induction into the Hall of Fame. Dorsett is a prime example that sometimes great things come in small packages. Constantly disregarded due to his small frame, at 5’11 and just over 190 lbs, Dorsett had to prove his doubters wrong. And he did just that as the starting running back for the Dallas Cowboys, who showed their faith in him by taking him with the second overall pick in the 1977 draft. Dorsett rewarded the Cowboys by rushing for over 1,000 yards and 12 touchdowns in just 14 games, on his way to winning Offensive Rookie of the Year honors. He broke the 1,000 yard mark in each of his first five seasons in the league, and in eight of his first nine seasons. 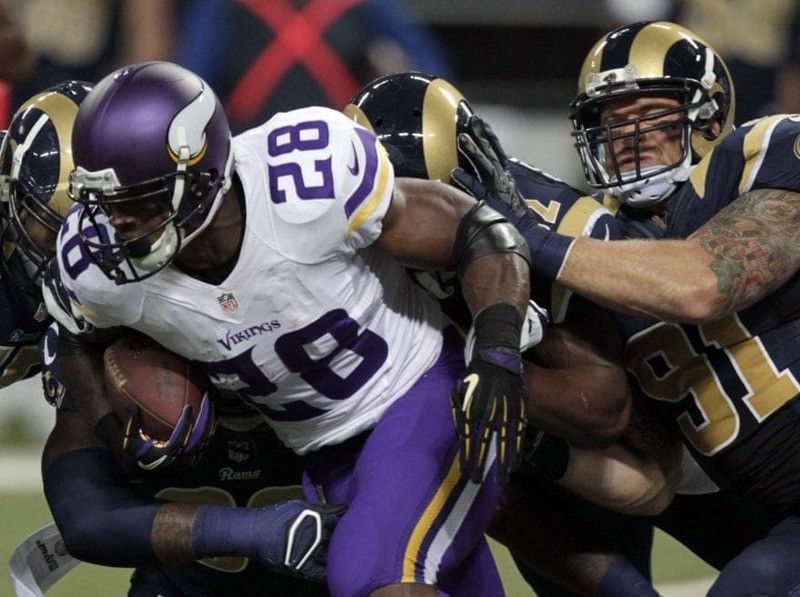 Peterson became an instant star in the NFL. In his first season in the pros, he set the record for the most rushing yards in a single game – 296 yards. Peterson later became a member of the 2,000 yards club, when he had the second-best single-season performance, running for 2,097 in the 2012 campaign. He was later named league MVP for his tremendous efforts that season. The following season, A.P. also reached the 10,000 career rushing yards mark, when he became the third fastest player to ever reach the lofty total. 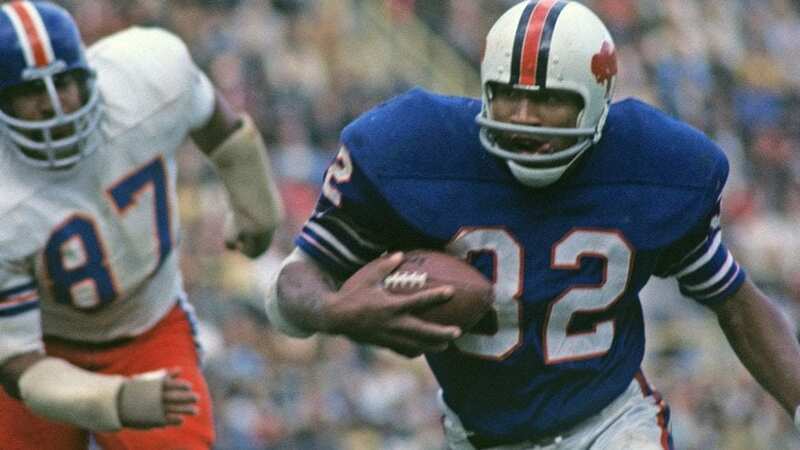 One of the most versatile running backs in the history of the NFL, Allen would often put on jaw-dropping highlights on film over the course of his career. His stats will make you look twice as well. Allen rushed for 12,243 yards during his time in the league, and he added a whopping 587 catches for 5,412 receiving yards as well. His combined 17,654 total yards from scrimmage still stand as the eighth most on the all-time list. Oh yeah, and let’s not forget that he was a touchdown machine – his 123 rushing touchdowns are the third-most ever, and he added another 22 receiving touchdowns placing him in sixth place on the overall touchdown list (145 total TDs). A key member of the “Greatest Show on Turf,” Faulk’s play in the late 1990’s and early 2000’s helped to propel the St. Louis Rams to the top of the football world. Faulk was a do-it-all player, who was a threat in all aspects of the game. He is the only player in NFL history to reach 12,000 rushing yards, as well as 6,000 receiving yards, over the course of a career. Faulk was an incredible weapon out of the backfield. 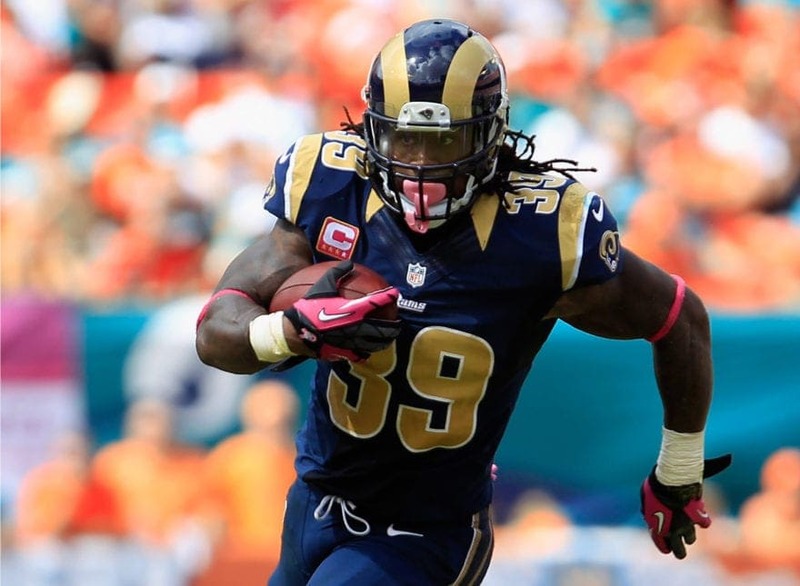 He was also the NFL’s Offensive Player of the Year three consecutive times with the Rams. In 2011, he was inducted into the Pro Football Hall of Fame. 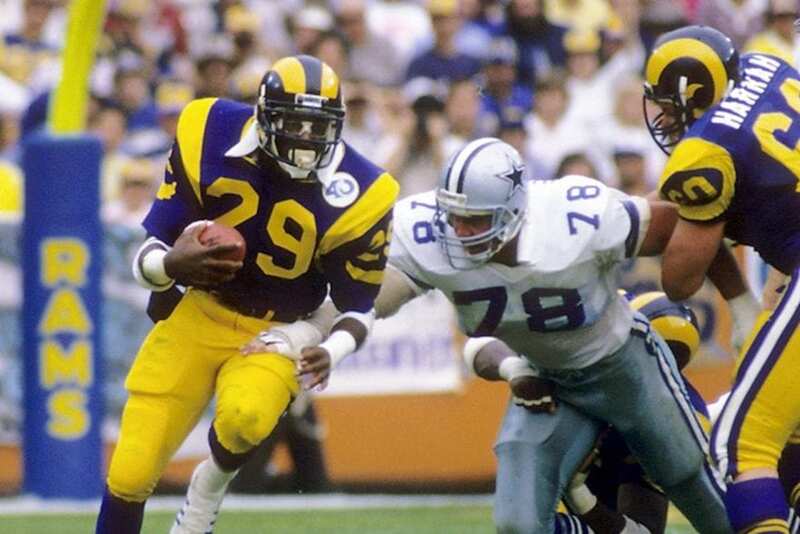 Hitting the ground running, Dickerson immediately announced himself in his rookie year, after being selected with the number two pick overall in the 1983 NFL Draft. In his first season in the league, he ran for 1,808 rushing yards to go along with 20 total touchdowns. For his efforts, he was elected Offensive Rookie of the Year and also became a Pro Bowl selection. In 1984, Dickerson broke the single-season record for most rushing yards in a season with 2,105 yards. He still holds this record to this day. L.T. was a man among boys. He had a true knack for the end zone, as he is still second all-time with 145 rushing touchdowns. 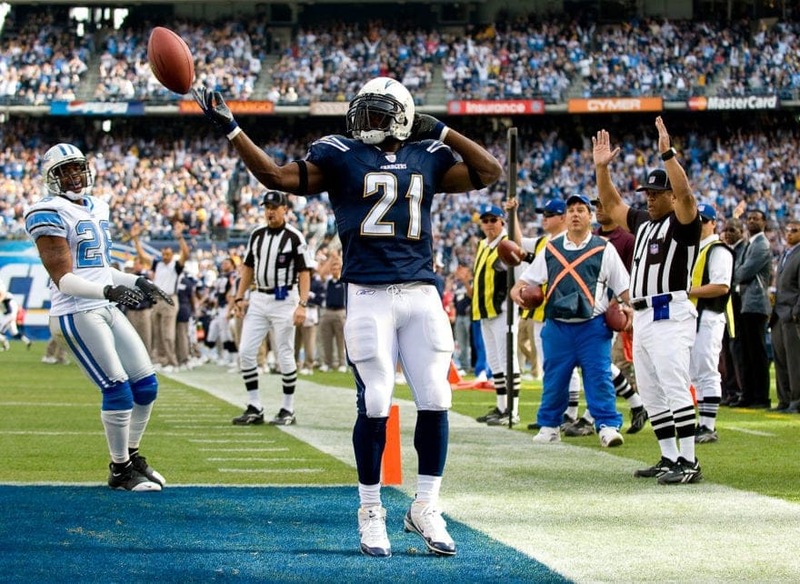 At the peak of his ability, he led the NFL in rushing in consecutive seasons in 2006 and 2007. But just as importantly, Tomlinson was a force to be reckoned with for opposing defenses as a result of his incredible versatility. He was a great pass catcher out of the backfield. He is currently in fifth place on the all-time list for yards from scrimmage, with 18,456 total yards (a list that includes the great WR Jerry Rice). Known as “Sweetness,” Payton was joy for all to watch. He changed the way the running back position was played, due to his incredible versatility. As a rusher, Payton achieved all of the major feats that can be reached by a rusher in the NFL. At one point, he had held the all-time records for rushing yards, touchdowns, carries, and yards from scrimmage. To this day, he remains in second place on the all-time rushing list, with 16,726 yards on the ground. 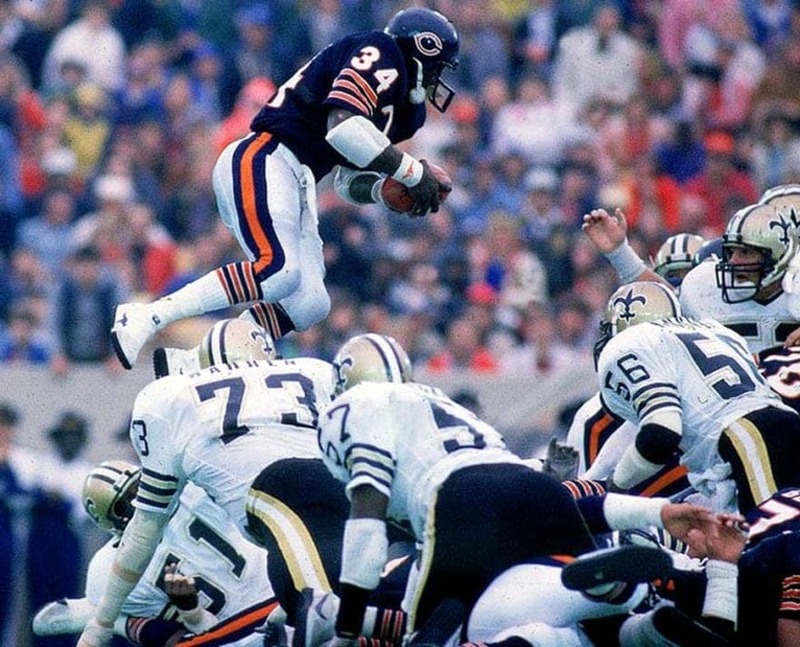 In 1977, he won the league’s MVP award, and later was a key member of the 1985 Chicago Bears (who many consider to be the greatest team in NFL history). A strong case could be made for Smith to be number one on this list. The most compelling point, is that he is the NFL’s all-time leading rusher (by a large margin) with 18,355 rushing yards, while also topping the list of most rushing touchdowns in NFL history with 164 scores on the ground. Smith was one of the most pivotal pieces of the 1990’s Cowboys squads, who won three Super Bowls. He also was the MVP of Super Bowl XXVIII, when he ran the ball 30 times for 132 yards and 2 touchdowns. Brown is one of the greatest football players to ever step foot on the gridiron. He was a strong runner, who dominated the league to the tune of three NFL MVP awards – unfathomable for a non-quarterback. But his sheer dominance propelled him to achieve that feat. Just how dominant was he? He played in the NFL for ten years , leading the league in rushing eight of those seasons. 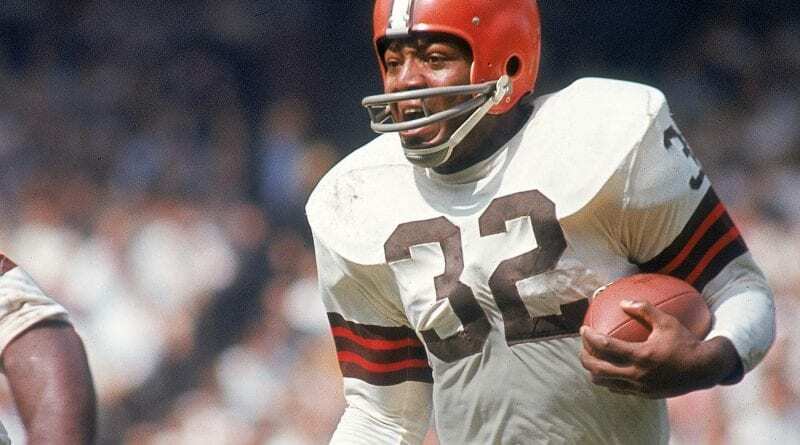 Brown was also a major factor in the most recent NFL Championship for the Cleveland Browns in 1964. There are some who consider him to be the greatest football player to ever step on an NFL field. There are many who consider Sanders to be the best runner the world has ever seen. And their claims are justified in several ways. Sanders put on a clinic from the moment he stepped onto an NFL field, making the Pro Bowl in every single season he played. He was known for making highlight reel plays, due to his artistically elusive style of running. It almost seemed as if he was playing flag football, since defenders often found it difficult to even get a hand on him. Despite playing just ten seasons, Barry still holds third place in the all time rushing list, with a whopping 15,269 yards (that’s a crazy yearly average of 1,527 yards), while also tallying 99 rushing touchdowns in the process. If his career had extended just a few more years, he likely would have shattered every major rushing record in league history.